The purpose of Mental Biology is broad: to challenge current thinking about how the mind works, what consciousness really is, and whether or not free will exists. Klemm methodically takes the reader through a short course in neuroscience, with a focus on the structure of the brain. He then spends the bulk of the book looking at the complex and often confusing issue of consciousness, exploring its role in learning and memory. Issues of behavior are raised when Klemm asks the provocative question, “Does consciousness do anything?” (His answer is “Yes, it does.”) The final section of the book takes us into a world that can be wonderfully confusing. Quantum mechanics, the Big Bang theory, string theory, and multiverses all enter into a discussion that draws few conclusions, but does raise a number of unanswered questions. Klemm provides a valuable insight that is often ignored or downplayed: the impulses transmitted throughout the nervous system are not made up of electrons, but positive ions. We tend to think of electrical signals as being due to electron flow (that works for TV sets, cell phones, and other electronic devices). If electrons were to flow through nervous tissue, a great deal of damage would quickly take place and the system would soon cease to function. Signals in the nervous system are propagated by movement of positive ions through membranes, producing a difference in electrical charge across that structure. As a key component of his basic thesis, Klemm introduces the idea of circuit impulse patterns (CIP). This concept more accurately reflects the reality of the linking of neural processes into a complex network than does the focus on a single nerve path and synapse. Neurotransmitters act in a variety of mechanisms depending upon the sum total of all the nerve impulses involved. By invoking the idea of CIPs, Klemm can then develop a sense of emergence of more complex phenomena from a set of less complex systems that interact, following ideas put forth in other settings by Philip Clayton and others. The idea of consciousness has intrigue philosophers, theologians, and neuroscientists for a long time. Klemm puts forth some interesting and challenging thoughts on this topic. He argues that the brain does not just contain the conscious mind, but actually develops it. Further, he states that the unborn child has a form of rudimentary consciousness at about month seven of the pregnancy (which opens the door to some troubling issues dealing with late-term abortions). In addition, Klemm feels that the normal adult brain does not achieve complete development until the mid-twenties. This idea is in keeping with a body of research dealing with impulse control showing conclusively that impulse control is not well formed until the early twenties. There are obvious implications in both the educational and legal realms for treatment of teens. Klemm parts company with much of the neuroscience community when it comes to the topic of free will. He first does his homework by listing and evaluating the different arguments against the idea of free will, and then goes on to provide his position that supports the concept that we do have freedom of will. In doing so, he challenges many current students of the question. His conclusions stand in contrast to those of other neuroscientists such as Daniel Dennett (author of Consciousness Explained, among other books). At times, Klemm drifts into a sort of mysticism. He states at one point “. . . life is a unique and seemingly magical category of creation . . .” In other passages he talks of life being a “miracle” and of a “mysterious life force” possessed by sentient animals and humans. Klemm gives no clue as to his personal philosophical position, so the reader is left to wonder whether he is speaking from some theological perspective or just using the vague terminology employed by scientists when they are confronted with complex life questions that they cannot answer using a naturalistic approach. Given the complexity of the material covered in the book, the Notes section at the end seems a little sparse. There are fewer than 200 references cited, with no comments attached to any of the citations. An expansion and elaboration of this material would definitely prove helpful to the reader. 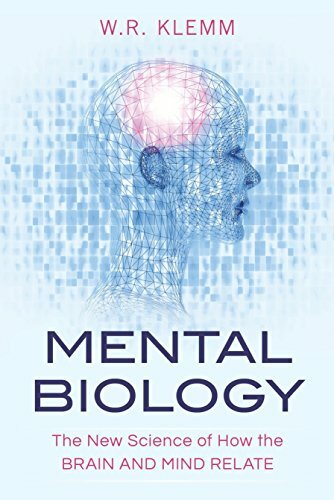 Mental Biology provides a challenging and thought provoking picture of one of the most complex and confusing issues in modern neuroscience. One cannot intelligently discuss the issues of conscious thought without including this book as part of the conversation.